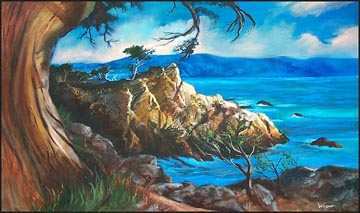 I n "Cypress Point," my goal was to tell a story in paint about the rugged splendor of this area of Monterey, California. I featured an old weatherbeaten cypress tree that for years was beaten by winds and storms as it stood as a solitary sentinel . It persevered with its own special beauty that comes from withstanding the storms of life. Constantly change your color. Having the same exact color over more than a three-inch area is monotonous. Artists are entertainers - they entertain visually. Instead of musical notes we use color and composition. Try to memorize what things look like by drawing a lot. Draw many trees and other subjects from life. Consciously attempt to memorize how things look by drawing from memory. You'll soon find out what you've forgotten. Then go back and draw from nature again and again until you've added to your memory bank. Then draw from memory again. By this means you can learn to memorize what things look like. Then when you draw and paint from these memories the opportunity is there for you to put your own emotions into the work. If you simply copy photographs, even your own, you'll never rise above the level of photo copyist. Art is much more than that.